McLaren Mercedes were the first team to officially launch their 2014 car, the MP4-29, at their headquarters in Woking yesterday. Whilst its new colour scheme has drawn the eyes of many, it also has a range of new technical features with a clear emphasis on innovation but nothing too (visually) ambitious. This is a good strategy heading in to this season as the team look to propel themselves back to the front of the grid. 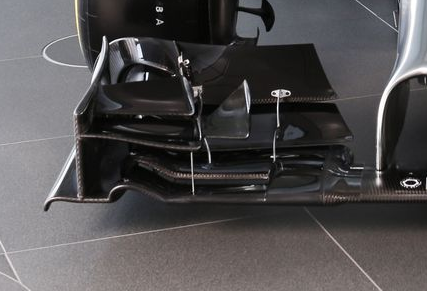 Let’s start at the most obvious change to the cars this season: the front wing and nose assembly. As covered in my 2014 build-up pieces, the nose takes on a new form this season in that its tip must be centred around a point 185mm above the reference plane, whilst the top of the nose that meets the front bulkhead must not exceed 525mm – 100mm lower than last year. McLaren have taken the decision to implement the most common nose design for this season – the ‘finger’ or ‘anteater’ nose. This design arises from the desire to maintain as much airflow beneath the chassis as possible, creating a low pressure area that produces downforce at the front of the car and also feeding the splitter, from which the airflow travels towards the diffuser to create downforce at the rear. 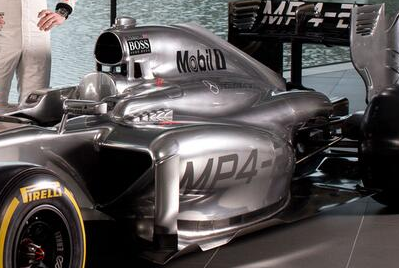 The MP4-29’s nose is much more elegant than those already seen on the Force India and Williams images. The upper nose and pylons form a large diameter arch, with the tip protruding from the centre. This gives a substantial area for airflow to pass around the tip and into the space created behind, with the tip itself creating minimal blockage. A popular option for this year, particularly for teams on a lower budget, could be creating a thin crash structure with a vanity panel mounted over it for aerodynamic benefit. 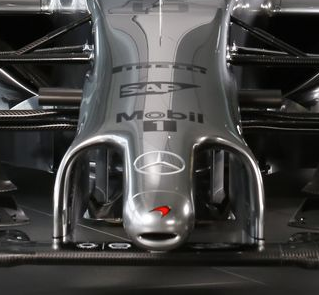 For McLaren however the entire nose structure appears to be made of one body, as the tip/pylon/wedged upper area smoothly join together to form one continuous profile. Also featuring on the nose are two turning vanes. These vanes have been pinched from last year’s MP4-28 and even date back to 2012. They are attached to the nose immediately behind the elongated front wing pylons, rather than attached to the underside of the chassis, creating a venturi tunnel. The main objective of this is probably to aid the deflection of the turbulence caused by the front tyres immediately each side of the vanes, working in conjunction with the Y250 vortex to seal the frontal section of the floor. The front wing is an evolution of last year’s, although McLaren have finally taken the initiative in developing a more modern wing that produces a greater outwash around the front tyres rather than pure downforce. The team have been a little behind in this area and the solution seen on the launch car is a good step in the right direction, for I expect even further improvements to arrive during the testing period. McLaren’s previous philosophy was too attach the elements of the wing directly to the endplate, generating higher downforce than its opponents. Managing the airflow with this set up, particularly around the front tyres, is more difficult as the airflow tends to continue in a straight line into the tyre instead of being projected around it. 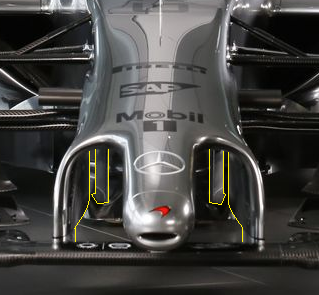 For 2014, MP4-29 has no more than 6 elements at the outboard edges of the wing, all of which bend vertically downwards to attach to the footplate. These elements fan outwards in the direction of the outer wall of the tyre, creating a more aggressive outwash effect. The greater amount of elements makes the airflow more manageable although peak downforce is lost as a result. With the reduction in rear downforce this year this should not be a huge issue to start with. Attached to the single endplate fence is the main cascade element – winglet made up of two elements. The main profile of the winglet is the same as 2013, although the edges now flick upwards at 90 degrees to form a sharp endplate. The two edges overlap eachother and look familiar to the cascade seen on the Ferrari F138 last year. With the front wing 150mm narrower this year, creating vortices to push airflow around the tyre will be an even greater development emphasis this year and this main winglet appears to be one such device in achieving this effect. Just off of this device is a smaller cascade that takes a few cues from its 2013 predecessor. Triangular in shape, its cross section increases further inboard and appears to be aimed at the front brake duct assembly. Although it may produce a little bit of downforce, its primary aim is to manage airflow around the front tyre. Although the intakes are very large (due to the ERS cooling requirements), the sidepods are heavily undercut at their base, allowing for airflow to pass to the central area of the diffuser. This process is aided by the higher gearbox height this year (crankshaft is 320mm higher), opening up space below the gearbox case for airflow to pass into. As well as the larger intakes, cooling louvres have been placed along the top side of the ‘pod to extract more hot air. Coupled with these two aspects are the new two new double-barrel heat exits at the rear of the car. These two channels, one on each side of the car, converge to create one large port that exits in parallel with the central exhaust pipe. The philosophy behind this design is rumoured to be based around replacing the beam wing in a virtual manner – a thermal beam wing. More on this later. Airflow conditioners have been placed on the flanks of the ‘pods, although their height has been reduced slightly, meeting the sidepod just below its shoulder. 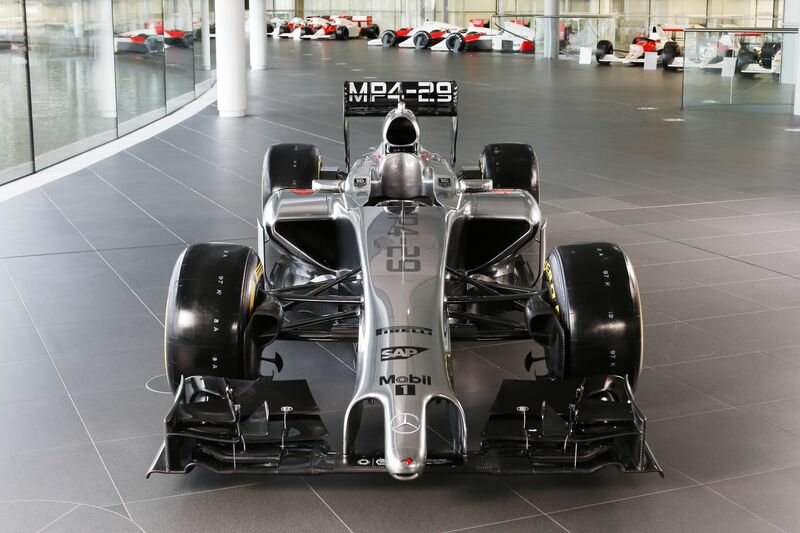 The reason for this becomes evident in the videos released during the launch which show a more complete MP4-29. 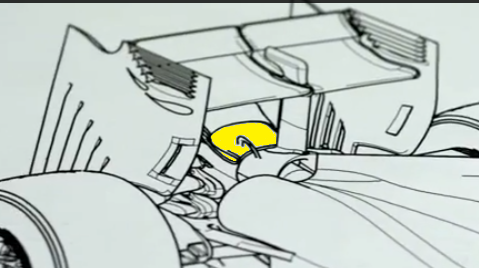 The sidepod shoulders featured in the drawings in the video include small chimneys, like those seen pre-2009 before the FIA clamped down on the cluttered bodywork. Sauber were the last team to field these sorts of heat extracting devices in 2011. McLaren signed Matt Morris from Sauber in 2013, so this could have prompted this design feature. The video also revealed a variety of airflow conditioning devices not seen on the launch car, including a set of vortex generators on top of the sidepod and a strake on the cockpit side. Although there is no exhaust plume to downwash over the floor anymore, the idea behind using these devices is to aim airflow towards the top of the diffuser, or towards the area they aimed the exhaust gases last year – the gap between floor and the rear tyre. As seen on the VJM07 and FW36 images, teams will still be placing fences/scrolls ahead of the this gap to produce vortices, offsetting the turbulence caused by the rear tyres and preventing it from impinging against the diffuser directly next to it. The devices on top of the sidepods will aim airflow towards this region to achieve this effect. The launch version of the MP4-29 did not include a 2014 specification rear wing, instead using a late version of last year’s for media purposes. Technical drawings of the car confirmed this. The shallower profile was clearly evident and with it brand new endplates. These feature extended slots inspired by the slat design of the 2013 Ferrari, although these do not extend to the top of the ‘plate. The longer slots will help airflow expansion at the rear of the car, possibly aided by the central exhaust exit and the sidepod barrel exits. Surprisingly, McLaren have opted to support the rear wing via a central pylon, forming a ‘Y’ shape as it wraps around the central exhaust exit. This ‘Y’ forms half of the Y100 (Monkey Seat) winglet, although on the launch car the other half wasn’t evident. However, the video once again revealed additional detail that will be evident on the car during the testing period. This is highlighted in the image above, mounted to the main support by a thin joining piece. Combined with the upwash of the Monkey Seat, the exhaust gases and heat exiting the sidepods create an upwashing effect. This is designed to replicate the effect that the beam wing had last year, although it will not be of the same strength. 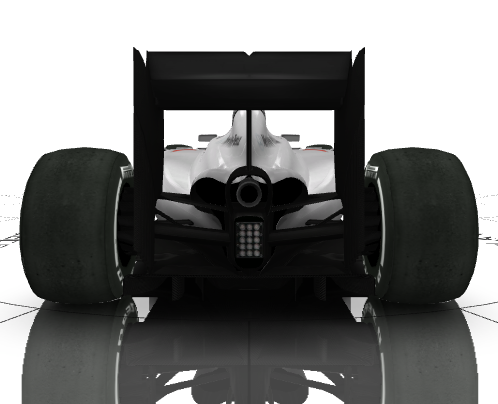 This could work in conjunction with the elongated rear wing endplate slots. Although the rumoured innovative rear suspension was not evident at the launch, the MP4-29 had some intriguing design choices around this area of the car. The upper rear wishbone arm extends a long way down the rear crash structure, replicating a miniature beam wing. Although it won’t produce downforce, its twisted shape will aid the management of the exhaust gases and hot air exiting the sidepods. Unlike last year McLaren have decided to leave the half shafts exposed, leaving the lower wishbone in line with the shafts rather than encompassing them as done in previous years. 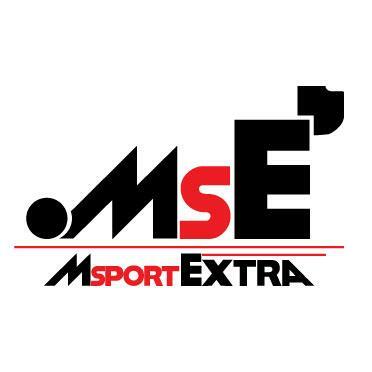 This entry was posted in 2014 Launches, Car Launches and tagged analysis, car, f1, launch, mclaren, mercedes, mp4-29, technical on January 25, 2014 by thewptformula.